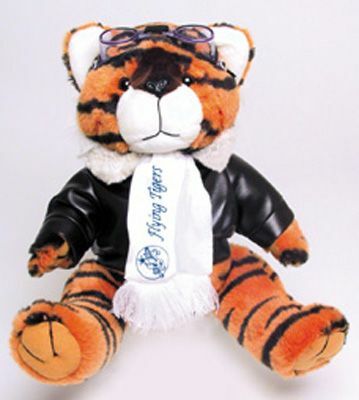 Airplane gifts - Our Flying Tiger is a fun plush animal. This plush Flying Tiger pays tribute to the famous Flying Tigers squadron. Our plush Flying Tiger, orange with black stripes, is outfitted with a faux leather flight jacket, goggles and white flying scarf imprinted with the Flying Tigers name and logo. An entertaining mascot for any pilot and enjoyable for children too!